North Carolina to Nebraska Freight shipping and trucking services are in high demand; Charlotte to Omaha is a very heavily traveled route. The Charlotte, NC to Omaha, NE freight shipping lane is a 1,143 mile haul that takes more than 17 hours of driving to complete. 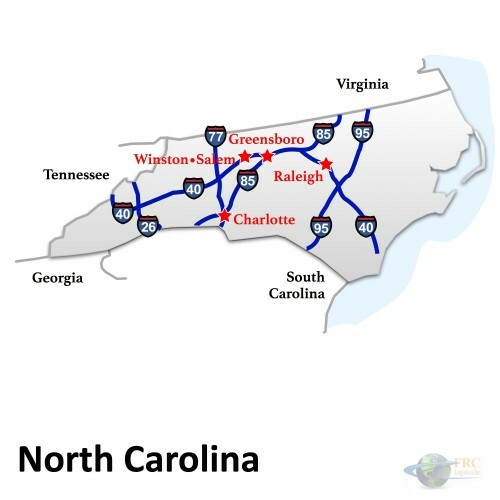 Shipping from North Carolina to Nebraska ranges from a minimum of 883 miles and over 13 hours on the road from Murphy, NC to Falls City, NE, to over 1,815 miles and a minimum driving time of 28 hours on the road from Carolina Shores, NC to Harrison, NE. The shortest route from North Carolina to Nebraska is along the I-40 W corridor; however there is a more northerly route that uses the I-64 W, traveling through Lexington, KY and Huntington, WV. The home of the Huskers, Nebraska is a state that provides a large amount of daily shipments throughout the United States. This great tradition in the state of Nebraska provides America with a very vast array of products on a consistent basis. The Freight Rate Central & our Nebraska Trucking Companies have emerged as one of the most loyal and dedicated trucking companies offered in Nebraska today. Nebraska lies in the central United States and is divided up into two major regions, The Dissected Till Plains and the Great Plains. The Great Plains which makes up the western side of the state, is a vast prairie used for cattle grazing. In fact the state is largely agricultural being a major producer of pork, beef, soybeans and corn. North Carolina to Nebraska Freight shipping quotes and trucking rates vary at times due to the individual states industry needs. Since North Carolina and Nebraska are an agricultural state, with many food processing and distribution centers, we see plenty of shipments by refrigerated trailer, flatbed trailer as well as by the more common dry van trucks. Our Less Than Truckload (LTL) carriers in both North Carolina and Nebraska are also running a number of regular services between the two states, and it’s an active route for heavy haul freight shipments, as well.